By Monday, I already feel behind for the week. The laundry is spinning, shushing it’s way through washing machine cycles and dryer loads. The dishwasher is halfway empty. I’ve been grabbing clean plates and cups all morning as I walk by. Grab and stash in the cabinet, go about my business and return for more on the next pass. My daughter’s arts and crafts from Sunday afternoon have left a Monday morning mess. Scraps of paper and felt dot the living room and dining room carpet. Popsicle sticks are scattered here and there on desks and tables in the playroom. There’s a pile of papers topped by markers and scissors, and glue sticks overflow onto the floor. And the glitter. Oh, the glitter. The playroom is aglow. I’ve been fielding phone calls and catching up on e-mail messages and social media all morning. And I feel the crunch of time, the deadlines and the to-do list, and part of me feels frustrated and maybe a little breathless. Deep down I want to blame the Rest. Why am I behind? I reason it out. Because I didn’t do any laundry on Sunday. Because I made origami cars instead of vacuuming. Because I read my book instead of writing. Because I take a break from social media and don’t answer emails and now they’ve piled up on me. I unplugged from busyness and plugged into family and soul and beauty and joy and God…and rest. Of course, I’ve thought it before. I probably will fight the lie for a long time: If I just didn’t take that break once a week, I wouldn’t be so busy and so behind now. This resting is counter-intuitive. It isn’t what makes sense to me in my self-focused, rational way of looking at life. And yet, it’s necessary. This walking away, this stepping back, this slowing down, this breathing in and out, this ceasing activity, this stopping the rush, this halting of busyness….it’s worship. It’s trusting God to take care of my little world and the whole wide world without me, and realizing just this: the world spins on and moves along even when I take a break. This is the shocking revelation that I need. It’s God, not me, that keeps it all going. Without the rest, we wouldn’t really get very far anyway. Oh sure, it seems to make sense. Do laundry on Sunday so the basket isn’t so full on Monday. Write on Sunday so Monday morning there’s less pressure to rush to the computer and type away. And yet, how far would we really make it before we crashed? How long could we go before our pride exploded and we forgot that God is really the one in control, so we ended up on our face in a forced and painful humbling? After all, how far would Elijah have managed to run without the food, drink and rest the angel brought him before his journey? (1 Kings 19). How long could the disciples have ministered, traveling on foot and mobbed by crowds, without time away with Jesus? How could Israel have made it to the Promised Land without seasons of rest by the mountain of the Lord, beside clean water, and with peace from their enemies? Even when they were pursued by the Egyptians, facing opposition and recapturing, still God didn’t tell the Israelites to grab their handmade weapons and armor and strive against the enemy. Instead, “Moses told the people, ‘Don’t be afraid. Just stand still and watch the Lord rescue you today. The Egyptians you see today will never be seen again. The Lord himself will fight for you. Just stay calm.’” (Exodus 14:13-14, NLT). Stand still. Just watch. Stay calm. 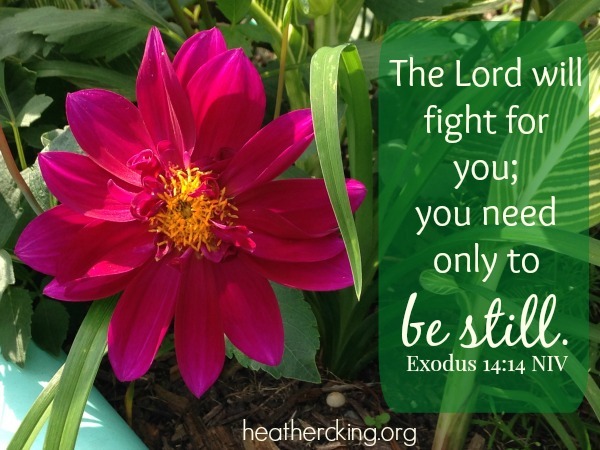 Let the Lord fight for you. “Then the Lord said to Moses, “Why are you crying out to me? Tell the people to get moving!” (Exodus 14:15 NLT). So it is for us. We trust Him in the waiting and in the resting. We trust Him in the moving and the battle …. and the laundry, the dishes, the to-do lists, the emails, the phone calls, the meetings, the appointments, and the deadlines. To read more about this 12-month journey of pursuing the presence of Christ, you can follow the links below! Won’t you join me this month as I ‘Practice Sabbath-Keeping’?